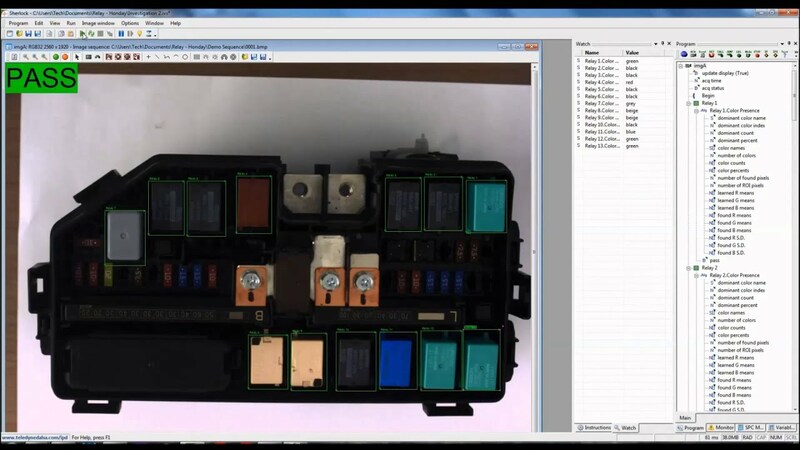 A new video from STEMMER IMAGING highlights the capabilities of an automated, 2-camera fuse box inspection system developed for a well-known car manufacturer. Using machine vision, the fuse box can be inspected and compared to the configuration specified in the vehicle build sheet. Originally a manual inspection of the fuse boxes was carried out and no record was kept of the inspection. With the machine vision system, a monochrome camera is used to read a bar code on the vehicle’s build sheet. The configuration of the correct fuse box is loaded when the barcode is scanned and it is then compared to data from an image of the actual fuse box present in the vehicle, which is recorded using a colour camera. If the match is incorrect, the test is automatically flagged as a fail and the missing/wrong parts are highlighted on a display before cars leave the factory. The vision system consists of a Geva 1000 high-performance multi-camera industrial controller from Teledyne DALSA, equipped with one Genie M1280 monochrome and one Genie C1280 colour camera, also from Teledyne DALSA. Both cameras offer a resolution of 1280 x 960 pixels operating at 24 frames per second at full resolution and both utilise the GigE Vision interface making it possible to transmit data over distances of up to 100 m.
Geva 1000 features a powerful dual core processor, equipped with high-speed memory resources for image processing and measurement. The inspection software for the application has been developed using Sherlock, Teledyne DALSA’s advanced machine vision software interface, which provides a rich suite of proven tools and advanced algorithms for automated inspection applications. Since a lot of light is needed over a wide area, the system uses a square light from Smart Vision Lights’ series of DLP Front Lights. These lights utilise backlit LED’s to provide intense and highly diffuse lighting, and feature a central hole through which the colour camera is mounted.